Cosigner For A Loan? What Does The Bible Teach About It? You are here: Home / Bible / Should I Cosign For a Loan? Should I Cosign For a Loan? A friend or family member needs a loan, but their credit score is not high enough (due to terrible or no credit history, or massive credit card debt), or they don’t have a large enough down payment or some other reason. So they come to you and ask you to be a cosigner on their loan. What Does It Mean To Be A Cosigner? To be a “cosigner”, simply means that you agree to assume the responsibility of another person’s debt if they are unable to pay it. For example, if you are a cosigner on your brother’s $20k car loan, you have now agreed to pay the bank back that $20k (or whatever is left at the time of default) if your brother is not able to pay it back. Many people will face this dilemma at one point in their lives. In fact, many people will actually cosign for loans even when they do not feel comfortable doing it. It is usually due to not wanting to be the bad guy, or is sometimes a genuine attempt to help someone. This is often viewed as a way to help out someone in need – such as a responsible, young person who just needs a chance to display or prove their credit worthiness; or a way to assist your child at the beginning of their “independent life”. But is this a wise thing to do? What Does The Bible Say About Being A Cosigner? A man lacking in sense pledges and becomes guarantor in the presence of his neighbor. Right away we see that the bible describes one who becomes a cosigner on a loan as “senseless“! We can see that it is not a wise thing to make a pledge based on someone else’s ability to pay back a loan. Do not be among those who give pledges, among those who become guarantors for debts. He who is a guarantor for a stranger will surely suffer for it, but he who hates being a guarantor is secure. So, we are actually told that we will “surely suffer” if we decide to pledge ourselves for another person’s debt; and that one way to stay secure is to “hate being a guarantor“! Those are very strong words to describe what has become such a common practice today. It was common to pledge a garment as security for a loan, but – according to Exodus 22:26-27 and Deuteronomy 24:10-13 – that garment had to be returned by sundown. The idea here is that one who is foolish enough to pledge himself for the debt of a stranger will most likely never be paid back; so the one making the loan should demand the cosigner’s garment as security for the loan. This shows the senseless and unpredictable nature of pledging your possessions or your life based on another person’s ability or willingness to pay their debts. Also, one question that must be asked is, “Why does this person need a cosigner?”. The most basic reason is that their bank does not believe that they will pay back the loan. They use their own experience, a few calculations and the potential borrower’s history with loans (usually expressed on their credit report) to make their decision regarding the loan. 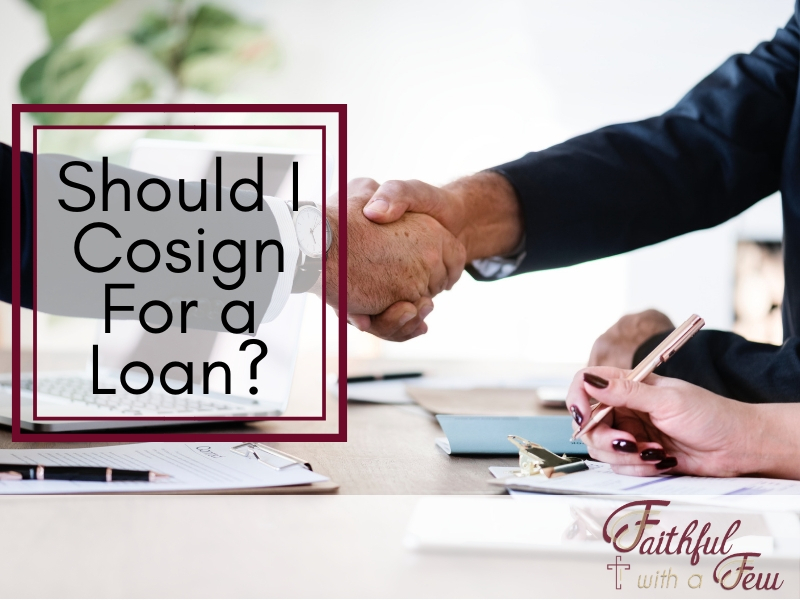 When they request a cosigner they are basically saying, “We don’t trust this person to be able to pay us back, but if YOU are willing to take all the risk then we will give him the money! What Should You Do If You Have Already Become A Cosigner? Do this then, my son, and deliver yourself; Since you have come into the hand of your neighbor; go, humble yourself, and importune your neighbor. Deliver yourself like a gazelle from the hunter’s hand and like a bird from the hand of the fowler. As we can see from the strong language in this passage, it is a serious matter to pledge yourself on behalf of another. This is because you have essentially given up control of something that God has given to you as a stewardship, and have become “snared” by your pledge. This situation is so serious that you must do everything that you can to free yourself from this arrangement and gain back control of your God-given resources. Look at how strong the language is here; you are told to “deliver yourself” and not to sleep until you have freed yourself (see Proverbs 22:7)! You are to act as a gazelle or bird that is about to lose their life to the hunter! So, if you are in this situation, it should be your highest priority to free yourself from this before you “surely suffer” (Proverbs 11:15; cf. Genesis 43:9, Genesis 44:32-33). What can you do instead if you want to help? If you still want to help while obeying God’s word regarding cosigning, there are a few things that you still can do. He who increases his wealth by interest and usury gathers it for him who is gracious to the poor. According to Deuteronomy 23:19-20, it was against the law for an Israelite to charge interest to fellow Jews (of course, loans were only to be requested in times of extreme need and poverty – not to fund frivolous, sinful spending like we see today), but many violated this command. As we see here, giving someone in need a loan and not charging interest is a way that you can assist the one in need and please God. Give them the money that they need. If you are able, giving your money to one in need – and only expecting repayment from the Lord – is another way to assist a brother in need and honor God with your finances. As mentioned earlier, since the bible teaches that debt is slavery (Proverbs 22:7), borrowing should only be done when one has a basic need that cannot be met by their income. It was usually a short-term loan, and the Israelites were commanded to forgive all debt every seven years (see Deuteronomy 15:1-15). Much of the borrowing that we see today represents a person’s desire to live above their means, and I do not believe that type of borrowing (or giving) is what God is speaking of. Hopefully, I will have a chance to address this in much detail in a future article. So overall we see that God is completely against the idea of one becoming a cosigner for the debt of another, even if we are really seeking to be a blessing to someone in need. However, the bible does teach us other ways in which we can assist others. I would love to hear your thoughts on cosigning – even better would be your experiences with it. If you have any questions on this or other concepts, please leave your comment below. Wow great article! I totally agree. If only I would have read this and fully listened to that discernment I wouldn’t be repaying back a loan right now just to keep my good name/credit from taking a big hit. This is a lesson learned but I thank God for still being faithful even in my poor decision that I made. I’ve been able to maintain repaying back the debt thus far but it’s been a struggle. Lesson learned the hard way but it’s LEARNED. I think you can loan money i you know the person is capable of repaying the loan. IF you are at all at doubt don’t do it. Its better to find another way to help the person than go into debt for them. It’s very interesting that even back then it was considered a terrible idea to put your finances in the line for another’s poor decisions. As they say, there is nothing worse than money between friends and family. This is an excellent write up. I appreciate this and has always respected my friend or whoever does not co-sign. However, I was in a situation – I have always paid my bills. Started a business as I was led by God. I had paid off my car 4 years before I started the business. It was over 200K miles and started breaking down on me. Also went through divorce so I did not have access to 2nd car I would have used. Needed to get my kids to school etc. I was scared to buy a vehicle I could just pay cash for. Even if I could afford like $7K, sometimes vehicles in that price range will end up costing you again like a car payment. However. I have never bought brand new because I think it loses value straight off the lot from stuff I have read. But I will only do 1 or 2 yrs old. I had used this one for 8yrs and driven what some do in 15yrs. So for safety and expense of repairs, my sister co-signed for me. She knows I would pay my bills, as always. I have always paid off in couple of years, much earlier than life of the loan. Divorce had spoilt my credit. I know your explanation is right and will be using that NOT to co sign for anyone. Except my sister that was there for me. Few days ago, I decided end of year when I can tell on tax situation, I will prioritize to pay this off lump sum. Which would be payoff in 1 year rather than 5yrs. I do not want my sister to “suffer”. There are instances when extra grace works. I believe that is what the case is for me and only her will I extend such grace too as well. Interesting article. I didn’t realize how directly the Proverbs speak to modern financial circumstances like cosigning loans. I am 100% against cosigning a loan. I have learned this by expierience. We are still trying to get our situation worked out. We cosigned for our church. Along with the pastor and 10 other people in the church. The church folded and not one of them people have helped us pay this loan. They could care less if it ever gets paid. I knew it was a bad idea when I signed it. I will never be guilty of it again. Funny how God works, well not really. I was reading Proverbs 6 this morning and just last night my husband and I had a discussion about our 38yr old son….again. Some 13 yrs ago I co-signed a student loan for him for 15k. At the time I asked him if he wanted me to manage it, or if he thought he was able…he thought he was. Second mistake! 6 months into his computer course his car broke down and he started missing classes. Instead of asking for help or fixing it, he just dropped out. At the same time, he met a gal and decided to impress her with bobbles using the remainder of the loan. When it came time to repay the loan, he only had to pay the interest, but even that seemed to be too much for him. He went back to construction work and it can be very sporadic. Eventually the bank asked for actual monthly payments and this too was hit or miss and I have had to make a number of them. I have tried to get my name off the loan, but as you can imagine, with his credit rating and job instability no one will touch him. So I am stuck with the payments he misses. To add insult to injury (or our stupidity) we have given him more money on occasion to pay his rent and bills over the years. I can hear your wheels turning, we have created a monster! Last night (after having prayed for him yesterday morning and his money issues) he calls saying he needs rent money.. that he is working and will pay it back…sigh. My husband said to ask his boss (our son-in-law ) for an advance and if he said no to call us back. This is the first time we have come even close to saying no. He didn’t call back. He is currently living with his ex-wife (in a platonic nature) for the sake of their daughter, but he has in the past been a couch surfer and moved back home. As a mother I do not want to see him on the streets, but I’m tired of paying his way! So, you asked for experiences….well, there’s ours! This article is great and all but what if the person who needs the loan is the potential cosigner’s daughter? I asked my father to cosign for a loan so I can go to college. The last time I checked, college was not a ” frivolous, sinful” way to spend money. He told me that he wouldn’t cosign for the loan because the Bible teaches against it. Everybody else that I’ve asked to cosign has either also said no or their credit scores were too low. I’ve tried applying for my own credit cards in order to build up my own credit but nobody wants to give me a credit card. I’m a 19 year old female trying to do something with my life and make something of myself. However, I am currently being forced to take this semester (and probably the next semester) off from school because I can’t afford it. Again, this is a good article, but where does it leave me and somebody in the same situation as I? What a great post Khaleef! It’s so amazing to me how many people will read this post and realize for the first time that the Bible has so much to say about this topic. It’s likely that a person could attend church regularly for 30 plus years and never be exposed to these Biblical financial principles you lay out in just one of your posts. Keep up the good work! It is so true. Unless you are looking for God’s direction on the subject, it can be very easy to overlook. Hopefully, many will be able to avoid the dangers of cosigning after reading this. I realize that I commented on this post when you wrote it, but I am now preparing one myself on a very similar theme. I hope you don’t mind me “stealing” some of your scripture passages. I will definitely reference you. Thanks for a well thought out and well referenced post. Thank you for the kind words! There is no way that you can “steal” the Word of God :). I just hope that it blesses your readers. Oh, you are still coming up as spam with Akismet. Hopefully, this will be fixed soon. Great article. There really is a lot to be learned about finance from Proverbs. Definitely, I’ll be looking out for the rest of your series! Great article! Thanks for sharing all of the verses that encourage us to not go into debt for someone else. I know of several people that have given money to others with the expectation that they would get paid back, only to have the relationship severed. I think it’s so important for us to line up with God’s will in these areas. I’m sure the people that you know with severed relationships would say that the money wasn’t worth it. I pray that I can be in a position to give someone money when they are in need, rather than issue a loan and risk the relationship. I would agree, give them the money if you wish. But never cosign. That is a bad idea. I am back…I am leaving this comment because I forgot to check the “notify me of followup comments” box when I make my prior comment. .-= Joe Plemon´s last blog ..The Sad Tale of Clarence and Evita =-. Very well done. This is probably the best researched article on this topic I have read. I appreciate the work you put into it. I agree that one of the main reasons people co-sign is because they don’t want to be “the bad guy”. My wife and I deal with that by simply saying that we never co-sign for anyone for any reason. I hadn’t thought about the loans without interest, but we also have a policy that we don’t loan money. We think the risk to the relationship (if the person doesn’t pay) is more important than any good will that could result from a loan, even interest free. Now before you get the idea that we are ogres, we choose to give money instead of loaning. We figure if we could afford to loan it, we can afford to give it. We feel good about giving, the recipient is appreciative, and the relationship stays solid. Thank you for your kind words. My wife and I have the same policy (even though I was once the recipient of a cosigned loan). I also agree with you that if you are prepared – and can afford – to give a loan, then for the sake of your relationship (and to further honor the Lord), giving the money may be best. I think you have a great policy. I would love to hear other’s experiences with cosigning and loaning money. @Angela Hello Angela, thanks for the comment. You are right that most people take out these loans because they are trying to live above their means. I also agree with you that providing sound advice would be a great help to someone who asks you to be a cosigner. We’ve never heard this subject talked about before, from a biblical perspective, and very much appreciate your insight. Thanks! .-= Steven and Debra´s last blog ..The Tea Party Elephant in the Room =-. Hello Caela, thank you for your question. In Proverbs 6:1-5 (which provides the strongest warning against cosigning), it reads “…if you have become surety for your neighbor…”, and Proverbs 17:18 says, “becomes guarantor in the presence of his neighbor”. I believe that in this context, the relationship referred to as “neighbor” is much more intimate than what we know today. There are other commands that use the term neighbor to refer to any close relationship (such as the command not to covet our neighbor’s property or wife – surely we are also prohibited from coveting our cousin’s wife as well). So we see that cosigning – as opposed to making loans with interest – is something that God’s word speaks out against in all situations (including close relatives), not just between strangers. In some of the scriptures you’ve used, the passages specifically talk about being surety for ‘a stranger’. How can one be sure that the text isn’t specifically warning against cosigning for someone who is not an intimate relation?